Many Aboriginal people are "financially excluded"
A study in 2011 for the first time measured "financial exclusion", where people lack access to appropriate and affordable financial services and products. The study found that Aboriginal people are over-represented in the 'fully excluded' category  which means they cannot access a basic transaction account, low rate credit card or basic general insurance. A report by the Centre for Social Impact in 2012 found that 43.1% of Aboriginal Australians surveyed were either severely or fully socially excluded compared with the national average of 17.2% . As a consequence some Aboriginal people struggle with low levels of financial literacy. They have trouble using ATMs and understanding bank balances and fees. In case of an emergency financially excluded people are more likely to turn to unregulated lenders who compound the problem, and they are far more likely to experience social exclusion and financial stress . The tradition of sharing resources among family and relatives puts even more stress on Aboriginal people. Most financial institutions have limited experience in dealing with Aboriginal customers  which can create barriers for them. Requirements for proof of identity can pose problems for some Aboriginal people, for example if they are members of the Stolen Generations. Because of their poor financial literacy, some companies are targeting Aboriginal people and pressure them to, for example, sign Aboriginal families up for plans they can't afford  or insurances they don't need (e.g. funeral insurance). "Our people, because of these policies and these funds, are being pushed into more financial hardship," Ms Combo said. Information must be culturally inclusive to reach Aboriginal people. 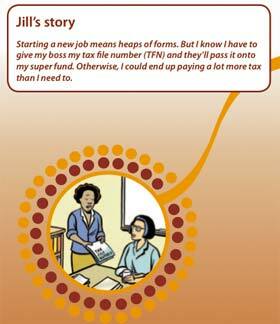 One way is to produce resources that specifically address them: Note the skin colour and Aboriginal art elements (detail taken from a booklet about superannuation ). But more and more people in the Aboriginal community want to learn how to better manage their income. One step towards financial self-determination is to have Aboriginal financial experts who can help their communities, especially in remote communities, where Aboriginal people may have travel long distances just to use a bank. In 2019 there were about 50 trained Aboriginal accountants in Australia. Besides offering advice around money at the family level, Aboriginal accountants also need knowledge about land trusts, government grants and native title claims. Food in many Aboriginal communities and homelands is already more expensive than in the bigger cities. Automatic Teller Machines (ATMs) add even more to these expenses. Only one ATM available. Remote communities only have access to one independently owned ATM and no alternative to paying direct fees for balance enquiries and cash withdrawals. Often the single ATM is privately owned. High ATM fees. Aboriginal people have to pay up to $10 per transaction or can only withdraw $100 at a time, costing them $5. Some retailers charge $5 for every $50 EFTPOS transaction. No free ATM access. There is "no evidence" of excessive ATM fees, but no free access to ATMSs or EFTPOS cash-outs either. Frequent checks, small withdrawals. Aboriginal people typically make frequent balance enquiries and small cash withdrawals due to a lack of infrastructure, low financial literacy, budgetary reasons or a lack of refrigeration. With an average ATM fee at $2 people can lose up to 20% of their weekly unemployment benefits. "When you are on such a low income and can't avoid those fees, it's a large per cent of your income and there's less money to buy food," says Fiona Guthrie, executive director of the Australian Financial Counselling and Credit Reform Association . She suggests to abolish all ATM fees for ATMs in Aboriginal communities. Aboriginal people frequently check their balance because payments into their accounts were often uncertain, ATM receipts were not kept, ATM cards were shared, financial counsellors encouraged balance checks, and because Aboriginal people wanted the check before getting a cash-out . Frequent small withdrawals are due to limitations on people's capacity to store food, humbugging (an obligation to provide money and goods to relatives, sometimes under threat of violence), and low withdrawal limits. Aboriginal people seem to have less opportunities to use the telephone or internet to make balance enquiries free of charge. In 2007 the First Nations Foundation partnered up with ANZ Bank to create My Moola: Opening Financial Pathways, an adult financial literacy program for Aboriginal communities. The interactive workshops link personal development and goal setting with financial literacy. My Moola aims to equip Aboriginal people with the skills they need for financial independence and sustainability, while exploring cultural attitudes towards money. Definition: Moola or moolah are slang terms for money. Financial literacy is not only important for the average community member, but also for students from remote communities who gain a scholarship, or young athletes going into the NRL or AFL and earning a lot of money. My Moola has been developed by Aboriginal people, for the Aboriginal community and is delivered by Aboriginal facilitators. Mob Strong Debt Help (1800 808 488) is a national, free legal advice service about money matters for Aboriginal people. It helps with loans, credit cards, home loans, banking, debt recovery and insurance. The Australian Securities and Investments Commission's MoneySmart website has a section that offers money tips for Aboriginal people. It offers videos, tips, podcasts, a consumer rights booklet and campaign videos in several Aboriginal languages. Further, its Knowing Growing Showing section has been designed as a financial literacy resource for teachers to support financial education of Aboriginal students. Its content is mapped to the Australian Curriculum. Aboriginal economy: Can it catch up through mining? Successful Aboriginal business? You bet!